Havant kept alive their faint chance of securing a London one south play-off place with a hard-fought 38-31 win at Chobham. The odds are very much against Will Knight’s third-placed side. The Hooks Lane outfit trail second-placed Medway by two points with just one game remaining. It would be a huge surprise if their rivals slipped up against bottom-club Gravesend in their final match of the season. But the Havant head coach was pleased with the way his troops did the job at Chobham. ‘Even if we pick up a bonus-point win in our final game it is unlikely to be enough,’ he said. ‘Since Christmas we have known we had to keep winning. ‘That won’t change for our final game. ‘We can only control what is within our own hands. ‘The last thing we want to do is lose and then find Medway had also slipped up. ‘I am pleased with the way we went about our business at Chobham. ‘They were a big, physical side with a very talented winger. ‘We were made to work hard for our win. ‘At half-time we were behind but this group of players have developed an increased resolve. ‘A couple of seasons ago we would have lost. Chobham led 17-16 at the break – with Havant’s points coming from a Ben Brierley try and a Reuben Knight drop goal. Skipper Joel Knight also knocked over a conversion and two penalties. Havant seized the initiative with three second-half tries, though. Scott Morris and Harrison Young touched down, while there was a second score from Ben Brierley. Joel Knight added two conversions and his brother, Reuben Knight, kicked a late penalty. 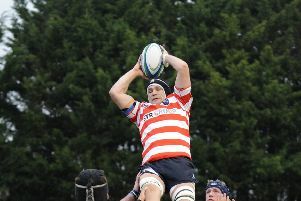 Chobham hit back with two late tries. Havant play their final game of the season against London Cornish at Hooks Lane on Saturday. ‘Whatever happens we want to finish on a winning note,’ added the head coach. United Services ended their Hampshire one title-winning campaign with a thumping 78-14 win against Ellingham & Ringwood at Burnaby Road. Services suffered just one defeat in the league all season and scored nearly 800 points on their way to the title.